EVOLVEO expands its range of SupremeBeat wireless portable speakers with a new C5. 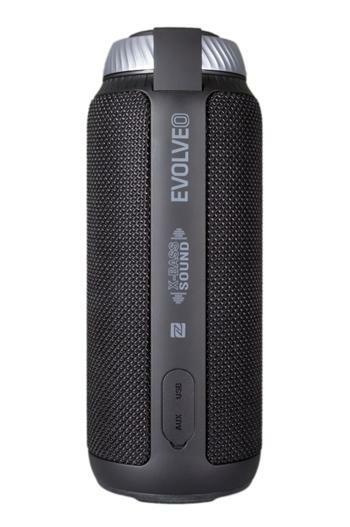 The EVOLVEO SupremeBeat C5 wireless portable stereo speaker provides a total power of 24 W and plays music files not only from a remote device but also from a microSDHC card thanks to the integrated card reader. This new speaker features high-quality design and stylish look suggesting this device delivers 360 ° surround sound. The transmitted sound is processed by the digital signal processor DSP. A pair of 48 mm dynamic neodymium 12W speakers and passive bass radiators supporting the X-Bass Sound system deliver powerful, distinctive sound with full bass frequencies and clear heights. Rotary volume controls and playback functions are located on the top of the speaker. The speaker can also be controlled directly from the paired device. High-quality materials, precise design and stylish look, together with the surround sound quality and enough output power, which can handle even larger rooms, make the EVOLVEO SupremeBeat C5 a great option to become a central speaker for home audio-video devices, notebooks, or other mobile devices including Smartphones. Thanks to its compact size (75 × 75 × 195 mm) and weight (550 g), it is easy to move and handle. The user can enjoy high quality music files, whether alone or with friends, literally anywhere. The Evolveo SupremeBeat C5 gets easily paired with a selected device supporting Bluetooth 4.1 and older versions. Built-in 5,200 mAh battery provides up to 15 hours of music playback. Automatic shut down after five minutes of inactivity saves the battery and prolongs the playback time. Speaker range of 10 meters. When the SupremeBeat C5 is paired with a mobile phone, it can also be used for hands-free calling. A button for receiving calls, volume control and a built-in microphone make call handling so much simpler. The EVOLVEO SupremeBeat C5 wireless portable stereo speaker is available at selected retailers and on-line stores for a final price of 63 EUR, VAT included.